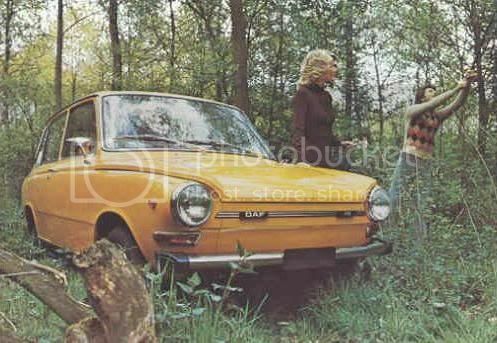 For 1975, DAF introduces an updated version of its 44, named 46. On the outside, differences are minimal, the 46 being identified by its two badges up front (“DAF” on the right of the front end, “46” on left) instead of the single badge on the left sported by the 44. Under the skin, the 46 adopts a rear De Dion axle similar to the one already fitted to the larger 66. Transmission is though entrusted to the Variomatic gearbox, but this time is connected to the rear wheels through a single rubber belt instead of two; this system forces the adoption of a conventional differential, while previous DAF could do away with one. These modifications, plus improvements brought to the passenger compartment (carpeting, reclining seats, modified dashboard), makes the 46 a heavier car than its predecessor. As its flat-two engine is unchanged, DAF engineers have used different gear ratios to insure that the 46 has the same top speed as the 44 but, by doing this, they negatively affected acceleration. 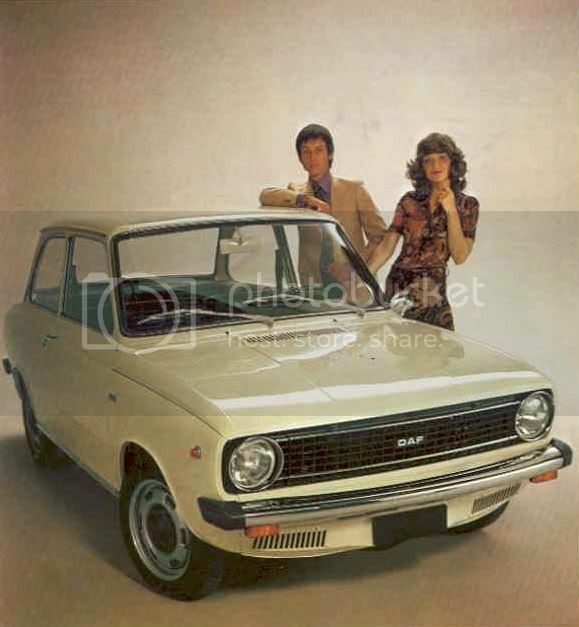 Though the 44 has been replaced by the new 46, it remains on sale for 1975, DAF stating that it is now considered an entry-level model to its range. Actually, these are simply unsold models that remains on hand after 1974; this model will definitely disappear once these stocks are exhausted. The year’s biggest news at DAF however comes on New Year 1975, as Volvo takes control of the company with the promise of maintaining in the Netherlands the production of the small DAF models (which should be renamed Volvo over time). ● Introduction: September 1966. Construction: unibody. Engine: air-cooled flat two, 0.85-litre, 40 hp, mounted at the front. Transmission: to the rear wheels through a continuous variable-speed gearbox. Suspension: independent on all four wheels. Brakes: hydraulic, to drums on all four wheels. Length: 385 cm. Top speed: 125 kph. Range: two-door “Comfort” saloon, two-door “Luxe” saloon, two-door “Combi Luxe” estate, two-door “Bestel Luxe” panel van. ● Introduction: September 1966 as the 44, October 1974 as the updated 46. Construction: unibody. Engine: air-cooled flat two, 0.85-litre, 40 hp, mounted at the front. Transmission: to the rear wheels through a continuous variable-speed gearbox. Suspension: independent on all four wheels. Brakes: hydraulic, to drums on all four wheels. Length: 388 cm. Top speed: 125 kph. Range: two-door “Luxe” saloon, two-door “Super Luxe” saloon, two-door “Combi Luxe” estate, two-door “Combi Super Luxe” estate, two-door “Bestel Luxe” panel van. ● Introduction: September 1966 for the original 44, September 1972 as the 66. Construction: unibody. Engine: water-cooled inline four, 1.1-litre, 53 hp, mounted at the front. Transmission: to the rear wheels through a continuous variable-speed gearbox. Suspension: independent on all four wheels. Brakes: hydraulic, to drums on all four wheels (Luxe), or to disks on front wheels, drums on rear wheels (Super Luxe). Length: 388 cm. Top speed: 135 kph. Range: two-door “Luxe” saloon, two-door “Super Luxe” saloon, two-door “Super Luxe” coupe, two-door “Combi Luxe” estate, two-door “Combi Super Luxe” estate, two-door “Bestel Luxe” panel van. ● Introduction: September 1966 for the original 44, September 1972 as the 66. Construction: unibody. Engine: water-cooled inline four, 1.3-litre, 63 hp, mounted at the front. Optional engine: inline four, 1.1-litre, 63 hp. Transmission: to the rear wheels through a continuous variable-speed gearbox. Suspension: independent on all four wheels. Brakes: hydraulic, to disks on front wheels, drums on rear wheels, with servo. Length: 388 cm. Top speed: 145 kph. Range: two-door saloon, two-door coupe, two-door “Combi” estate.